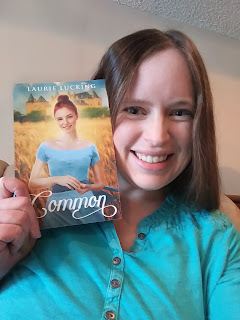 Laurie Lucking: Happy Release Day to Common!!!! Happy Release Day to Common!!!! I have been in love with books and stories since I was a little girl. Many years later, as a college student, I didn't sell back my books as so many of my classmates did, because I couldn't bear to part with them. Even the ones I didn't like! I've always just had this strange reverence toward books, the need to cherish them. But the idea of creating my own book? That was too much to hope for. I remember so clearly the day I wrote the first scene of my first manuscript. I'd done some soul-searching while pushing my newborn around in his stroller on a beautiful fall day, and come out of it with the crazy idea to write a book. I even had a story idea - something I'd imagined years before but never thought to write down. After my son fell asleep, I opened my laptop, stared at a blank Microsoft Word document for a few minutes, and then started typing. It was so much fun! Way more fun than my memories of grade school creative writing assignments. But then my husband came home. I'm in the habit of telling my poor husband EVERYTHING at the end of each day. So part of me really wanted to tell him about my writing, and yet...part of me really didn't. I confessed at dinner, waiting in trepidation for the laughter or scorn. Not because my husband is that kind of guy, but because I felt I deserved that kind of reaction. Instead, he nodded and said something along the lines of "Cool. That sounds great." And that inner spark that had been lit grew a little bigger. Because maybe I wasn't crazy or unworthy to write a book after all. That was over five years ago, and I've learned and grown so much along this writing journey. It hasn't all been as fun as that first moment, but it's been one of the most challenging and rewarding ventures of my entire life. In some ways today feels like a culmination of all that dreaming and hard work, in others just a major stepping stone, because I have so many more stories I can't wait to tell, and I hope this will be just the first book of many! Thank you so much for coming on this journey with me, I'm beyond thrilled to have the opportunity to share Common with you! Also, the Common Blog Tour is still underway! We've had so many fun posts so far, sharing everything from my writing process to a character interview to visuals from the world of Common. So make sure to check out all the posts from the past week and a half, and stay tuned for a few more fun posts to wrap up the tour. 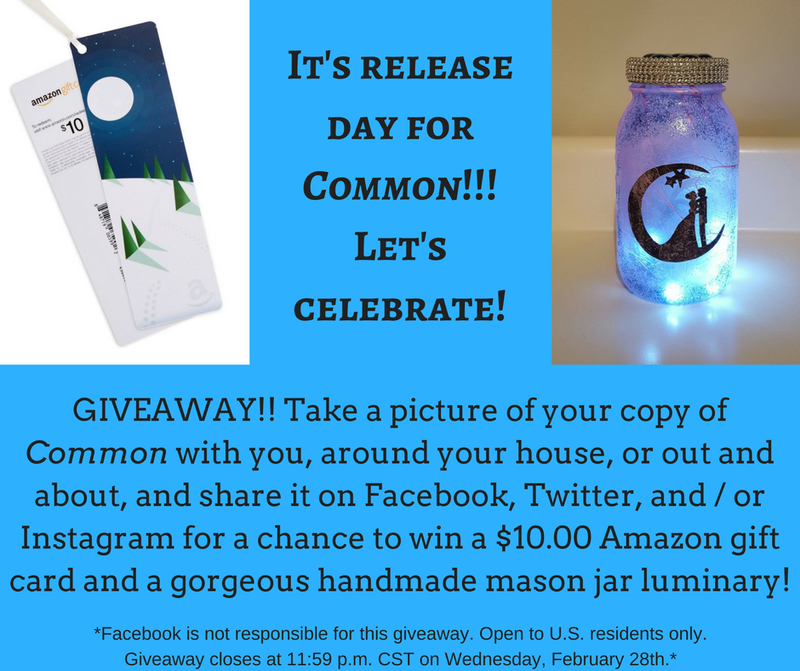 I'll list all the blog tour stops below, but first I have to mention that the release celebration continues with a Facebook party TOMORROW, February 15th, from 8:00 to 10:00 pm CST. It's going to be a great opportunity to hang out with fun people, chat about amazing books, and enter for a chance to win even more giveaway prizes! I hope to see you there!!! You can RSVP and see some sneak peeks here. As promised, here's the full list of blog tour posts. Thanks again for stopping by to celebrate with me today!!! !